The NHL playoffs are coming back to Winnipeg in 2019. Building off of the excitement from last year’s playoff run, tickets to this year’s Winnipeg Jets playoff games are sure to be the hottest in town. Fans will once again be eager to get their hands on tickets, and unauthorized ticket resellers will be looking to take advantage. Though season seat holders have playoff tickets waiting for them, many Jets fans will have to find other means. Forget the Google search and go directly to winnipegjets.com/tickets. By purchasing through the official website of the Winnipeg Jets Hockey Club, you are guaranteed that the seats purchased for a Winnipeg Jets game are 100% legitimate and represent an actual seat in Bell MTS Place. One unauthorized online ticket reseller had posted seats in section 119 for the first home game in the first round of the playoffs at $722 USD each, or $974 CDN. Those tickets are actually valued at $444 each with ticket fees included, and the tickets were posted prior to the April 8 date when the Jets actually put the tickets on sale. Donnelly added that when purchasing tickets on open resale market sites other than SeatExchange, fans have no way of knowing whether the ticket they purchased is invalid, counterfeit, or actually represents a seat inside Bell MTS Place. Spotting a fake ticket is nearly impossible, making the vendor that you buy from that much more important. Many resale sites may also use similar sounding names to verifiable listings, meaning buyers need to proceed with extra caution. The issue of playoff ticket resellers may be front of mind, but these issues are present for concerts and events at Bell MTS Place and the Burton Cummings Theatre as well. There are still risks to be aware of when purchasing a ticket in person from an unauthorized seller. Bell MTS Place and the Burton Cummings Theatre do not allow print-at-home tickets meaning that any paper tickets someone may try to sell you are not legitimate. Additionally, ticket buyers should never accept a screenshot of a ticket. Vendors may send multiple copies of the picture, or they may be altogether invalid. 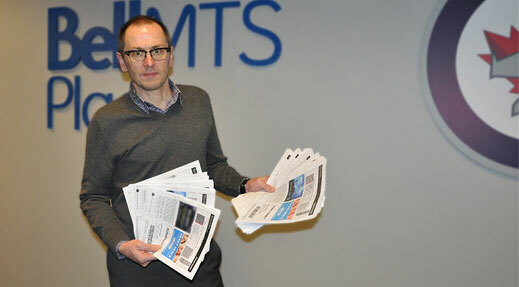 Photo: Kevin Donnelly, Senior Vice President, Venues & Entertainment at True North holds hundreds of fraudulent tickets that were presented for a Bell MTS Place event in fall 2018.